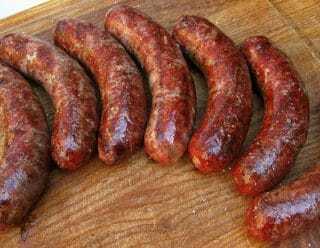 Toulouse sausages are the classic ingredient in cassoulet, that hearty bean, confit and pork extravaganza that is a hallmark of any self-respecting French cook’s repertoire. Traditional Toulouse sausages are all pork, and are minced by hand rather than ground — a fine option I do myself from time to time. 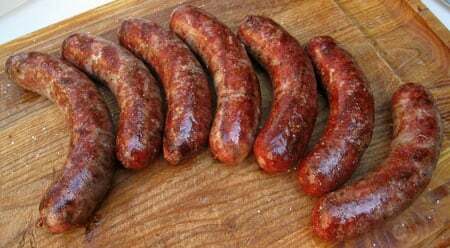 What makes a Toulouse sausage unique? First the coarseness of it, but also its simplicity: It requires black pepper and garlic, that’s all. Many versions, such as the one Paula Wolfert describes in her masterful The Cooking of Southwest France, include nutmeg. Mine does, too, and if you can manage to grind your own nutmeg on the spot, you will notice a difference. Don’t be tempted to add other flavors here. These need to be simple. These links are excellent grilled slowly over hardwoods, roasted gently in a 350°F oven, and, of course, as an element in cassoulet or other winter stews. 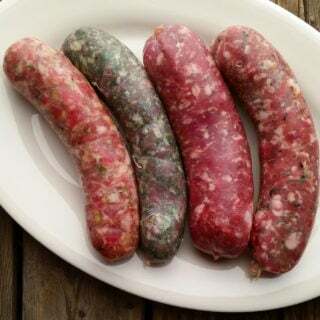 This is a classic French sausage normally made with pork, but I like mixing in wild duck, venison or hare with fatty pork to make these links. They are great on the grill or in a cassoulet. If you are smoking them, you will want to use the curing salt No. 1, which you can buy online. Chop the meat and fat into chunks of about 1-inch across, mince any skin you are using, then mix the garlic and all the spices together and toss with the meat and fat. Chill the meat and fat until it is almost frozen by putting it in the freezer for an hour or so. Add the wine and mix thoroughly either using a Kitchenaid on low for 60-90 seconds or with your (very clean) hands. This is important to get the sausage to bind properly. Once it is mixed well, put it back in the fridge for 30 minutes or so. Stuff the sausage into the casings all at once. Twist off links by pinching the sausage down and twisting it, first in one direction, and then with the next link, the other direction. Or you could tie them off with butcher's string. Hang the sausages in a cool place for 4-8 hours (the colder it is, the longer you can hang them). If it is warm out, hang for one hour. Once they have dried a bit, put in the fridge until needed. They will keep for at least a week in the fridge. 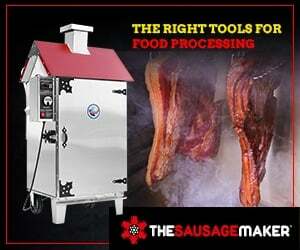 You can find recipes for fresh and smoked sausages from all over the world, right here on Hunter Angler Gardener Cook! This batch was with a limit of mallard, gadwall and a teal. It was exactly 3 lbs of breast meat. I’ve made a handful of your sausage recipes and I think this is at the top of the list. It was simple and the flavor was great. I might add a bit more black pepper and certainly the fresh nutmeg next time. I just needed to get it done and didn’t have it easily accessible locally so I used shelf purchased ground nutmeg. Thanks again, Hank for extending the menu at our home. Everyone that tried it didn’t believe it was duck. I received several positive comments from about 6 different people! woohoo! !